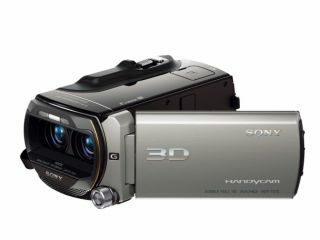 If the new 3D-capable Sony Bloggie's just don't cut it for your amateur 3D movie making needs, then you might be more inclined to invest in one of Sony's just-announced 3D Handycams. There's two of everything: two lenses (naturally), two Exmor R sensors, and two image processors. UK pricing is still 'tbc' though we know that the US price when it launches in April is around $1500 (£969). So it's not cheap, basically. However, if it's a fully-specced high-end camcorder that you want that is pretty well future-proofed, then the new Handycam could well be worth a look-in. What all these strange and bizarre marketing words mean is that the new 3D Handycam shoots decent 3D video. Though we will have to see exactly how decent it is when we get hold of a review unit to test out in the coming months. The HDR-TD10E also lets you watch your 3D footage without glasses on an Xtra Fine 3.5-inch 3D LCD touchscreen display. Of course, the new Handycam is really being marketed to those early adopters that have already invested in a fully 3D capable HDTV (or are perhaps already starting to think about making that investment). Aside from the high def 3D shooting, you also get a 10x optical zoom with Optical SteadyShot (Active Mode) and iAUTO in 3D mode, along with 64GB of flash memory.